Agave nectar is a sugar alternative that comes from the desert plant agave. 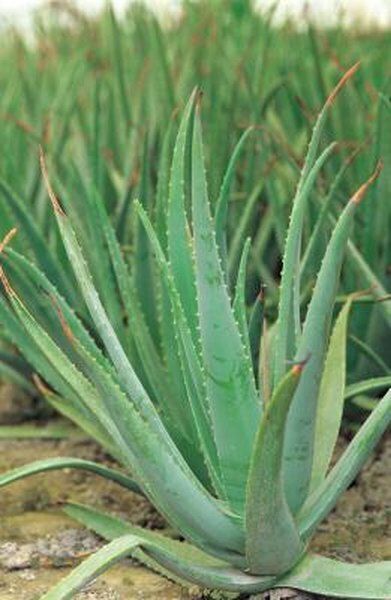 Agave has cultivated a reputation as a “natural” and “raw” sweetener because it isn’t synthetically produced and is heated to only very low temperatures during processing. Although processing methods for light and dark agave differ slightly, they have nearly identical nutritional values. You can find the syrup in two varieties: light and dark, otherwise known as amber. Light agave nectar is filtered more extensively and heated to lower temperatures; as a result, it tends to have a milder taste. Amber or dark agave, in contrast, is less thoroughly filtered and ends up with some residual solids in its finished product. It may taste more bitter than light agave and have a flavor reminiscent of molasses or maple syrup. Despite differences in texture and flavor, light and dark agave have virtually identical nutritional profiles. One tablespoon of light agave nectar has 60 calories, no fat, 16 grams of carbohydrates and no protein. A tablespoon of amber agave nectar has the same calorie, fat, carbohydrate and protein values. Each type of agave has about 1 gram of dietary fiber and a total of 15 grams of sugar. While sugar has approximately 15 calories per teaspoon, both dark and light agave has closer to 20 calories per teaspoon. Although that variance may not seem like much, it can quickly add up when baking with large amounts of sweetener. However, agave nectar has 1.4-times the sweetness value of sugar, so you don’t have to use equal amounts in baking. For every 1 1/2 cups of sugar, try using about 1 cup of dark or light agave. Although dark and light agave nectar are derived from a natural plant and do not undergo as much processing as some types of refined sugar, they are not calorie-free and are not health foods. Virginia Tech researchers who penned a 2009 study in the Journal of the American Dietetic Association noted that agave nectar contains minimal antioxidant activity and that other sweeteners, such as maple syrup and blackstrap molasses, have considerably more antioxidants. Additionally, a high intake of sugar substitutes such as agave may lead to some of the same health problems that lots of added sugar can lead to, including obesity, diabetes and dental issues. Agave is not necessarily a healthier alternative to processed sugar, although since it is sweeter, you can get a similar effect by using less. To keep your health as a top priority, however, limit any sweeteners in your diet and focus on eating nutritious fruits, whole grains, vegetables and lean proteins.